There are always good reasons to play it safe. Repeating the past may be painful, but at least it’s predictable. Fear is the reason today is like yesterday. 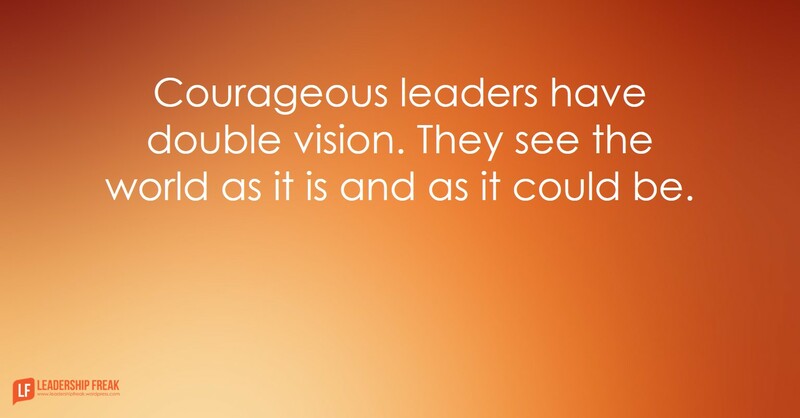 Courageous leaders have double vision. They see the world as it is and as it could be. Look problems in the eye and see opportunity. Fear sees threat. Courage sees opportunity. Leadership perception isn’t pretending.Threats exist. Accept reality, then make it better. Look people in the eye and see strength. Overcome the seduction of developing weaknesses. Look the present in the eye and see the future. Think about where you’re going, even as you accept where you are. Leaders with vision shape the future. They don’t ignore the present. Courage always turns toward the future. Courage in you inspires boldness in others. Own fear by naming it. Admit mistakes. Only posers pretend to have it all together. Own the mistakes of others. Patterns of failure are leadership’s responsibility to address. Keep people working in their strengths. Retrain, reassign, or remove people who persistently fall short. Provide glimpses of your true self. Practice courageous vulnerability. Talk about noble mission when facing problems, challenges, and adversity. Establish points of certainty. Live and lead in full alignment with vision and values. Values are foundations of certainty in turbulent environments. Be predictable. Always stand with your team even when they screw up, for example. Persistently celebrate progress and press for better. Fear focuses on threat. Courage focuses on opportunity. How might leaders find courage for themselves? How might leaders inspire courage in others? Lead by example inspires courage for me, having seen others do the same is the direction I prefer to follow. Typically experience gets us to this point, there are times you just fly by your instincts as well going with the gut so to speak. Development of courage is a lifetime of trail and error for some, others just carry the cross all time because they are naturally courageous, fear is the building block of courage to step were you never stepped before. Thanks Tim. I like the idea that you don’t have to go first to have courage. It takes courage to go second. Courageous leadership think as much about the unintended consequences of their decisions as the consequences. Unfortunately, too many leaders are not courageous. They fear losing power. Thanks Jim. I was thinking about all the contexts where courage is part of leadership. It takes courage to accept the responsibility for the impact of our actions on others. It seems to open up the idea that we may intend one thing but the impact might be another. It’s easy to resort to blame when that happens. It takes courage to evaluate, adapt, and start again. Max De Pree released his book: Leadership is an Art – in 1987 – 30 year ago. He makes the point regarding effective influencing and understanding comes from healthy relationships. Thanks Paul. I’m so glad you expanded on DePree’s insights.